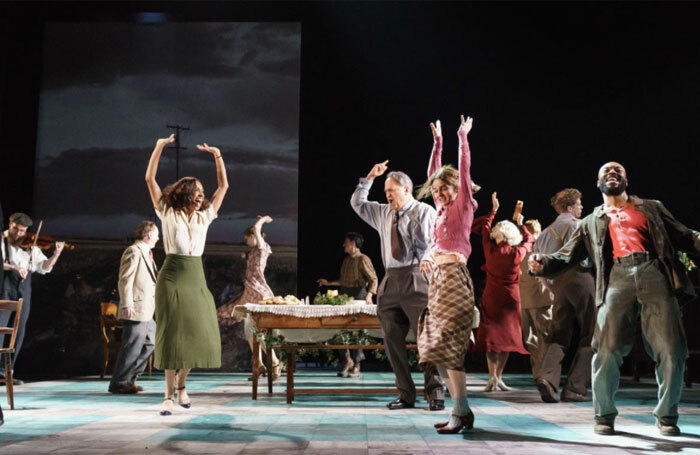 There is possibly more riding on Girl from the North Country when it opens next Wednesday at the Old Vic Theatre than any other show to play the West End this year. With a script and direction by award-winning playwright Conor McPherson  and songs from the back catalogue of folk legend Bob Dylan, there is a huge anticipation that surrounds it. But its opening carries added significance for the industry beyond its own box office success, or otherwise. Its creators have been quick to point out this is not a “jukebox” musical, and it has instead been described as “a play with songs”. Even at the Old Vic’s season press launch, its Artistic Director Matthew Warchus described it as being hard to categorise. Producers will be watching this production closely. In contrast to the pop music jukebox shows that have run for decades, a number of commercial producers have attempted to replicate their success by bringing cutting-edge songwriters into serious drama. They have tried to create a theatre format which connects with music fans who would be more likely to attend a gig at CBGB than a Broadway theater. The path to a successful drama with music, however, is haunted by the ghosts of high-profile failed projects. Girl From the North Country is the second commercial show to use Dylan’s back catalogue. The Times They Are A-Changin’ played disastrously on Broadway in 2006, closing after just 28 performances. It was a similar fate that also befell the works of Tupac Shakur in 2015 when they were given the musical theatre treatment for a short-lived Broadway production called Holler If Ya Hear Me. In recent years, only Lazarus  – which used songs by David Bowie – may be considered one of the few musicals by a contemporary artist to have received a degree of commercial success. Nonetheless, Lazarus stayed away from both the West End and Broadway. Had Bowie not died during its premiere season at the New York Theater Workshop, then the production – which had generally received lukewarm notices – most likely would have been seen as a curiosity and thereafter consigned to musical history. None of these productions were biographical musicals using the artist’s back story as well as their back catalogue. Instead, the songs were threaded into an original storyline which failed to engage either the artist’s core fan base or a wider mainstream audience. Watching Lazarus, I was left simply longing for the next classic Bowie number to inject some excitement into the surprisingly banal text. This also reiterated the point that if these works are to succeed, they require equal strength of both song and story. Mercifully for Dylan fans, The Times They Are A-Changan’ resisted going the whole musical-theatre hog and sticking an exclamation mark in the title. But there is still an intrinsic problem across many of these past musical theatre attempts. To the fans of these artists, musicals are just not cool. In contrast, many producers relish the understandable “coolness” of saying they are working with edgy or respected musicians. Such “coolness” by association can even make these shows easier to capitalise. But, the production must then deliver; and it is foolish to assume that just because something is popular in one genre, it will work in another. There is an obsession among many producers that when one hit show comes along, the way to find the next hit is by replicating the current box office smash as closely as possible. I have given up counting the times a musical is pitched as “the next [insert title of current hit show here]”. At the moment, inevitably, Hamilton is the go-to pitching crutch. However, when it comes to pushing the musical form forward, Hamilton could ironically end up becoming musical theatre’s greatest drawback if everything that follows is either compared to it or attempting to mimic its form. For musical theatre’s future and evolution, it should not keep selling and pitching its new works as “the next Hamilton” or even “Girl From the North Country”, should it prove a hit. The genre’s future success crucially depends upon original ideas in form and theme that help to drive it forward. It does not mean ignoring past hits, but remembering they became so popular because of being unique and ground-breaking. The very fact that Girl From the North Country is described as hard to categorise could prove to be its biggest advantage in finding out whether the structure of this work can connect and succeed with both serious music fans as well as today’s mainstream commercial audiences.